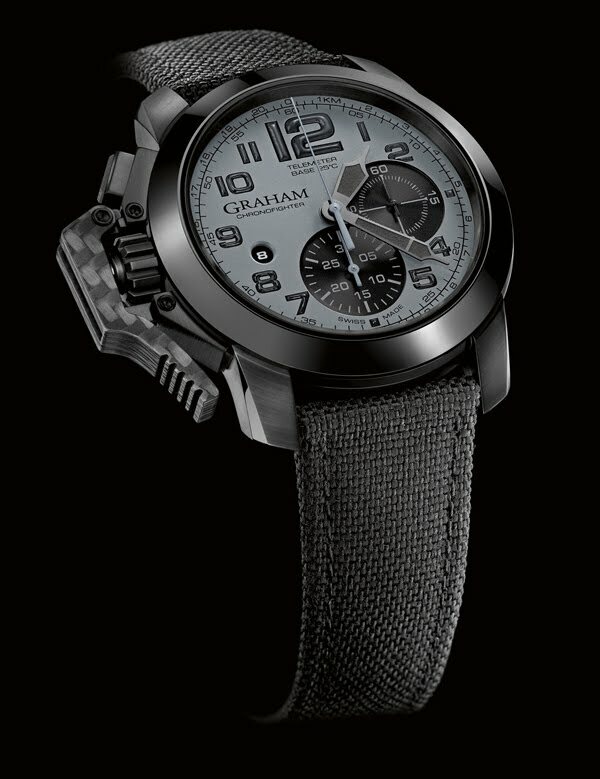 Daring GRAHAM is prepared to brave the elements to put its new generation of Chronofighter Oversize to the test of real life. The sturdy and wandering chronographs do not fear extreme conditions and have been developed for explorers and modern conquerors. The new Chronofighter Oversize is already a legendary wrist machine as the performance goes far beyond technological limits. Every adventurer knows that world is dangerous and insecure. Wind howling, weird sounds from nowhere. Thick forests, sharp mountains, dangerous animals, fickle weather, unknown tribes...everything is conceivable. A nameless world appears around you. A world in which the most exciting adventures can happen. 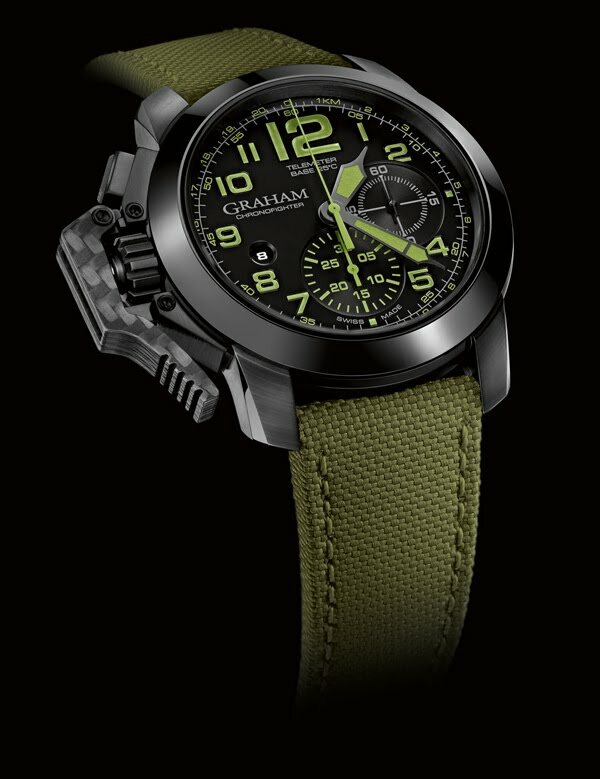 The new Chronofighter Oversize has been developed to survive in today’s toughest environments. Completely re-engineered, the Chronofighter Oversize features many characteristics which will help explorers of modern times to survive and move forward through real life conditions. The start and stop lever on the left of the case, renowned GRAHAM signature, is made of plain carbon material and results from a very specific machining process. This means that thelever is a unique piece of carbon which provides the watch with more stiffness and enhanced usability. The black ceramic bezel gives the watch its strength and shining personality. To brave the elements, each watch is also endowed with a calculated telemeter scale. It enables to measure distances thanks to speed of sound by starting the chronograph when a visible event occurs (e.g. lightning) and stop it when the sound reaches the observer (e.g. thunder). As the temperature influences the speed of sound, our engineers have based their calculations on 25°C, the average temperature on Earth. The distance in kilometres can be measured on the dial thanks to the scale rim (346 m/s). 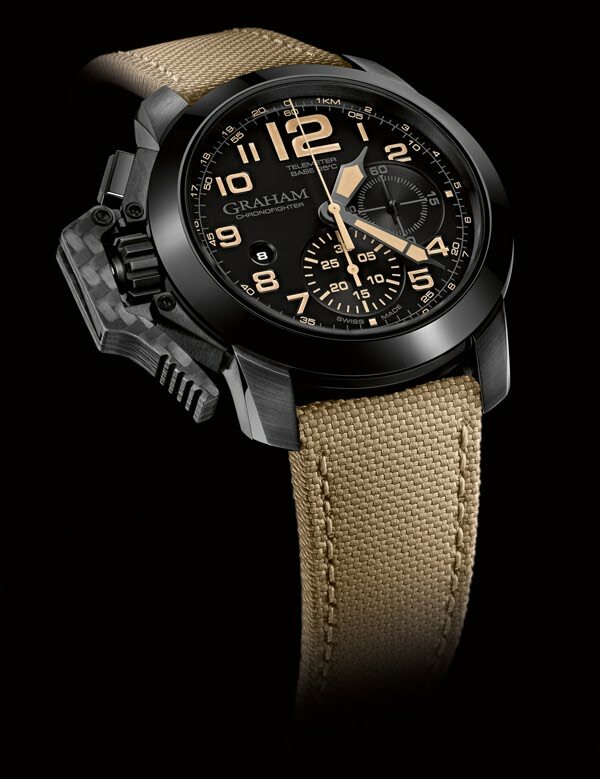 High-tech material and processes have been used to create a watch that withstands dangerous and rugged environments: a watch you can absolutely rely on. The watch is light to wear and safe. The colours of each watch will help you blend into every world. Get your back-pack ready. GRAHAM will take you to the most inspiring climes.